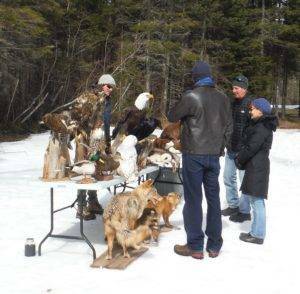 Harvey Moore – PEI’s 1st Naturalist! 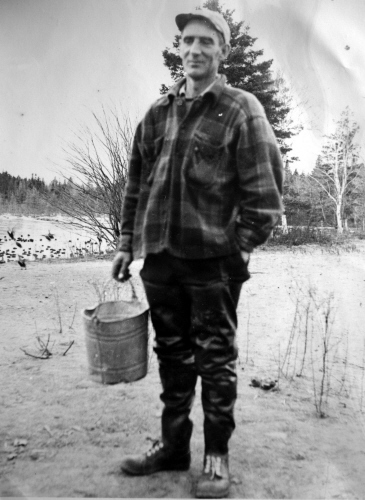 Harvey Moore (1916-1960) was an avid outdoorsman and naturalist. In 1944, he purchased property from Harriet Molyneaux and began to establish a bird sanctuary for migratory waterfowl. His vision for the 115 acre property was to create a safe staging area for migrating waterfowl that travelled along the Atlantic Flyway, but also to provide safe habitat for resident wildlife. He achieved this by creating two very large ponds on the upper northwest branch of the Sturgeon River. The first year only a pair of ducks arrived, but this had increased to fifty by the second year. A decade later an estimated six thousand birds arrived and during the winter, several of these, especially black ducks, overwintered on the site. Harvey Moore became renowned for his ability to gain the trust of the birds. He could feed them out of his hand and could even pick some of them up to band them without using traps. He also cared for injured, sick, or wounded birds which came to the Sanctuary for respite. The variety of birds which can be found at the site include: Black Duck, American Widgeon, Pintail, Mallard, Blue-winged Teal, Green-winged Teal, Ringneck Duck, and Canada Geese. After Harvey’s untimely passing at only 44 years of age, the site was inherited by his wife and sons who cared for the property until 2004 when the site was then turned over to the Province. In 2013, the Southeast Environmental Association began working on the site to carry out upgrades and make improvements after which in 2016, SEA took over ownership and management. The legacy of Harvey Moore continues to be honoured each year at the University of PEI. The Department of Biology annually awards the Harvey Moore Memorial Scholarship to a fourth year student who shows particular interest in studying Island wildlife. Additionally, thousands of waterfowl still visit the sanctuary and as a Wildlife Management Area, it will always be a haven for waterfowl as Harvey would have wished.